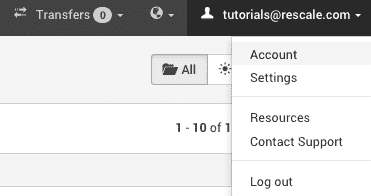 While logged in to your Rescale account, click on your email address in the upper right corner, and then select Account from the menu that appears. On the account page you’ll see a summary for the last few months. There is a link on the right to download your usage for each month in a comma-separated values (CSV) file, which can be easily opened by Microsoft Excel for further analysis. You can also view a summary of any credits you have received and a usage chart by clicking on the corresponding links in the menu on the left.